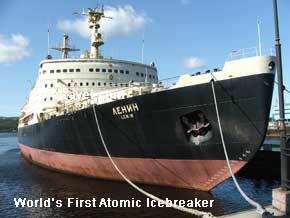 Absolutely worlds largest nuclear icebreaker 50 Year of Victory in Murmansk. Do you want to visit? The largest nuclear-powered icebreaker in the world has been put to sea and left St. Petersburg for Murmansk the "50 Let Pobedy" or "50 Years of Victory" icebreaker, which has been under construction since 1989 and was built at the Baltiisky Enterprise ship factory, was successfully tested in February 2007. The icebreaker will follow a Northern Sea route for the ice channeling of vessels during the 2007 spring navigation period. 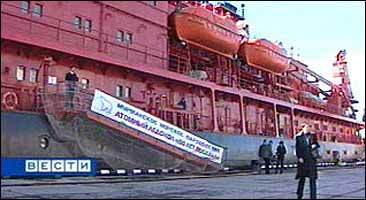 An upgrade of the Arktika-class icebreaker, the 159-meter (522-foot) long and 30 meter (100-foot) wide vessel, with a deadweight of 25,000 metric tons, is designed to break through ice up to 2.8 meters deep (9.2 feet). It has a 138-man crew. 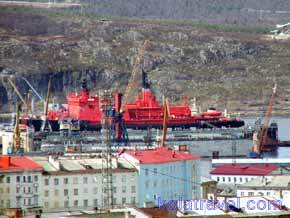 The Russian nuclear-powered icebreaker fleet, which is operated by the Murmansk Shipping Company, currently consists of five Arktika-class icebreakers (Arktika, Sibir, Rossiya, Sovetskiy Soyuz and Yamal), and two Taymyr-class river icebreakers (Taymyr and Vaygach). 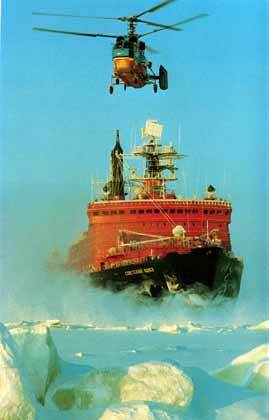 According to experts, Russia will need six to 10 nuclear-powered icebreakers in the next 20 years, as demand for them grows with the development of the Arctic shelf and increased traffic along the Northern Sea route. "Have you ever been on the bridge of a real Atomic Icebreaker?" 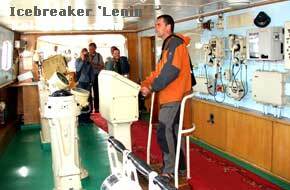 With this excursion you will not only be on the bridge, but you will also visit the Captains cabin, crew cabins, galley, control rooms for communication, turbines, engines and the reactor room. It's thrilling but absolute safe. Click info@kolatravel.com for more info.